Nautilus is the fitness company behind Bowflex, Schwinn, Octane Fitness, and Universal. In recent years the Vancouver based company has merged technology with fitness equipment as evidenced with the Bowflex Max Trainer (Bluetooth and MyFitnessPal compatible) Bowflex HVT which combines cardio and strength training, and various treadmills with wireless capabilities. In October 2017, Nautilus will launch the Modern Movement line featuring the M-Pad Balance & Strength Trainer and the Edge-Board Core Strength Trainer, both of which work seamlessly with the M-Trac app to allow you to work out, play games, and measure balance and strength. Both products are portable, fitting into a duffle bag for gym or hotel workouts. Here’s a breakdown of what each Modern Movement product can do. 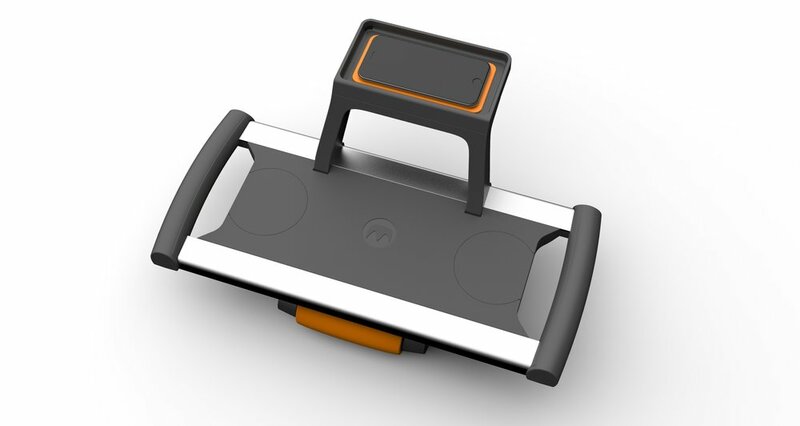 The M-Pad syncs with the M-Trac app (screenshot below) provides the ability to do various things while standing on an upgraded balance board. The pad itself can be used with three different heights; you adjust the heights by changing the rubber pads on bottom which range from low (beginner) to high (advanced). The M-Pad allows for more than just side to side movement. You can move front, back and in a circle making it the ideal tool to strengthen the core and lower body. In the M-Trac app, you choose to play, train or measure. Play allows you to use your feet as a controller to score points games such as Space Invaders, “Side-to-Side” where you keep a sliding colored marble on top of a sliding white marble, and “Bulls Eye” where you try to drag a marble into the center. Measure mode lets you track your balance improvements over time and Train mode provides exercises to do with M-Pad. Use the M-Pad at a standing desk, during work breaks at the office, at home while watching TV, at the gym, basically anywhere. 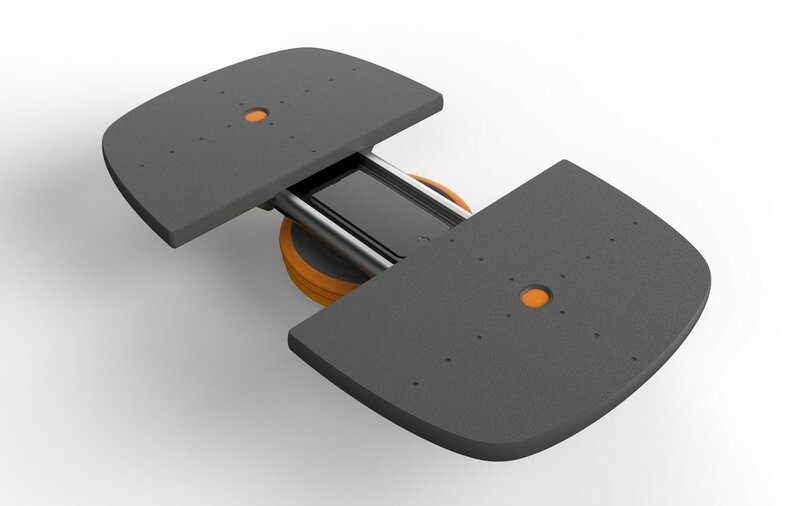 The Edge-Board is a smart hybrid between a slideboard, valslides, stability ball, and ab roller. The M-Trac app guides you through workouts that include ab extensions, hamstring curls, front/side/rear lunges, crawls, knee-ins, pikes, and more. A removable phone holder makes sure your device is close by so you’re doing perfect form as the app tracks your reps. The patented brake feature can be turned on or off, which stops the Edge-Board after you’ve extended it a certain distance. The box also includes comfortable rubber knee pads. I’ve only seen one other core training device that allows for a smart device to be holstered onto it and that the Rock360 by Fewdm. What makes the Edge-Board different is that it weighs less, it’s more portable, and you can place your feet on the Edge-Board whereas the Rock360 can only be held with your arms. Plus, the Rock360 is centered around a big ball. The Edge-Board is perfect for personal trainers looking to maximize space without additional equipment, home gym enthusiasts who prefer to stay in for workouts, athletes rehabbing from lower body injuries, and many more populations. The Modern Movement line will be available in October 2017 at www.modmov.com and at select retailers. The M-Pad is $119 and the Edge-Board is $69. Hamstring Curls with Nautilus Modern Movement Edge-Board. A demonstration of how to do a forward lunge with the new Nautilus Modern Movement Edge-Board. Bowflex Trainer Tom Holland demonstrating the Nautilus Modern Movement M-Pad balance trainer.